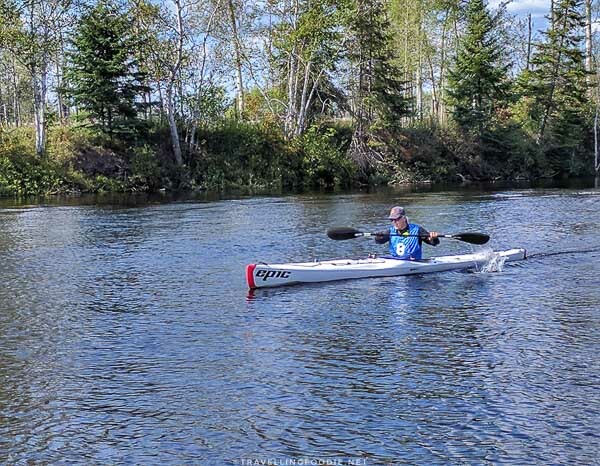 The 9th Annual Great Canadian Kayak Challenge & Festival took place in Timmins, Ontario on August 25 – 27, 2017 at the Mountjoy Historical Participark. 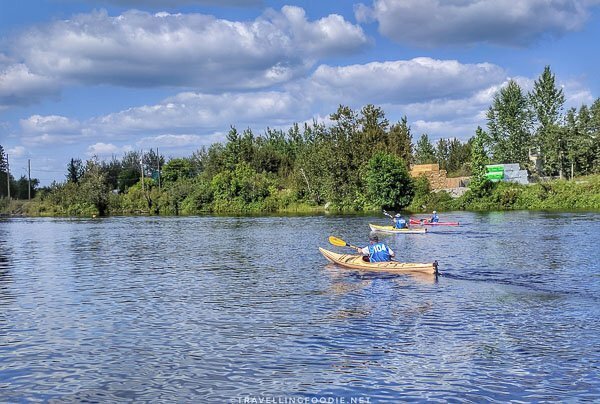 With hundreds of lakes and rivers, paddling is definitely a popular summer activity in Timmins. 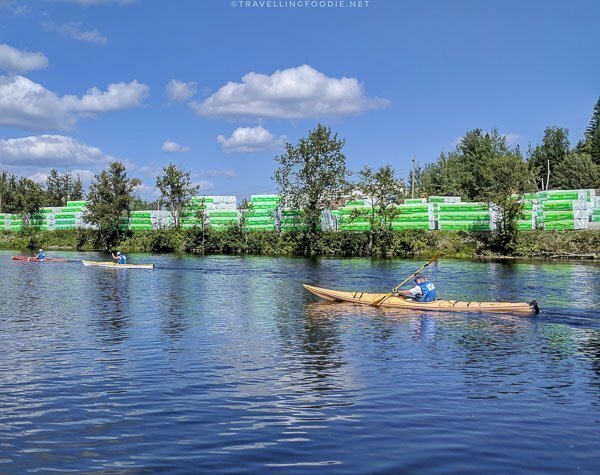 People from southern Ontario like Toronto, London and Montreal travel to Timmins for kayaking. I had the pleasure of attending this great event as part of a week-long press trip with Tourism Timmins. What a beautiful weekend it was for the festival! 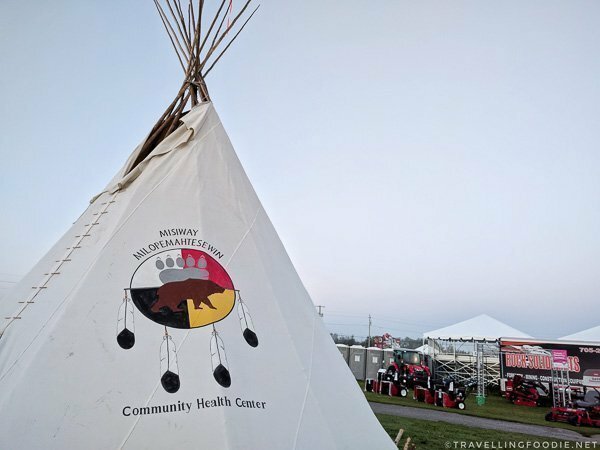 Over 20,000 people attended the event which featured live performances, art & culture exhibits, food vendors, an interactive Aboriginal village, stunt shows and various seminars and activities. The festival event schedule was packed with so many things to during these three days. Here were some of the highlights during the festival that I got to experience! 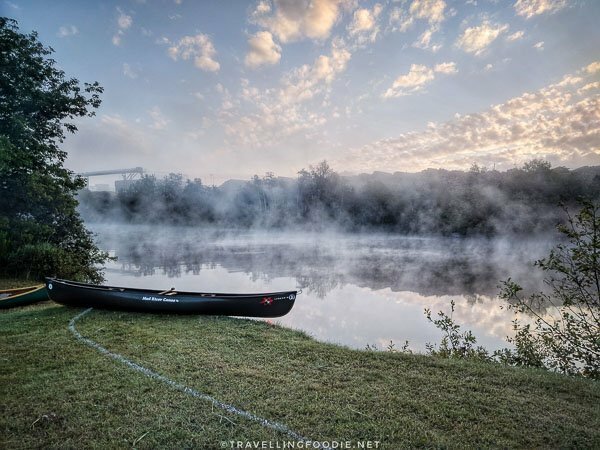 The opening ceremonies were held at the Aboriginal village along the Mattagami River at 6:30AM. I’m not a morning person, but I’m so glad I woke up early for this as it was quite an interesting ceremony to learn about traditions of culture and spirituality of the Aboriginals. The Aboriginal elders performed the ceremonies, which were attended by members of public and some Aboriginal people as well. The sacred fire lighting roots back to the earliest stories of creation in the Aboriginal community. The fire was lit in a fire ring and all of us huddled around it. We were then given some tobacco and cedar to hold on the left hand, specifically because it is closer to the heart than the right hand. The smudge ceremony then took place. Herbs were burned in a bowl, and each of us had the chance to take in the aromatic smoke. A pipe was lighted for smoke, and the blessing of the water was held. The significance of the ceremonies is to give thanks to Mother Nature – the air, water, and earth that surrounds us – and our ancestors who lives amongst us, and to the men and women in our lives. Each of us then walked up to put the tobacco and cedar on our hand to the fire, and walk clock-wise around the fire back to our spot. When the ceremonies ended, the chief went to hug each person in the circle clock-wise. When a person receives all the hugs from the people walking clock-wise, that person then goes to walk clock-wise and hug everybody else as well. This happens until the circle gets dispersed and everyone has hugged everybody. 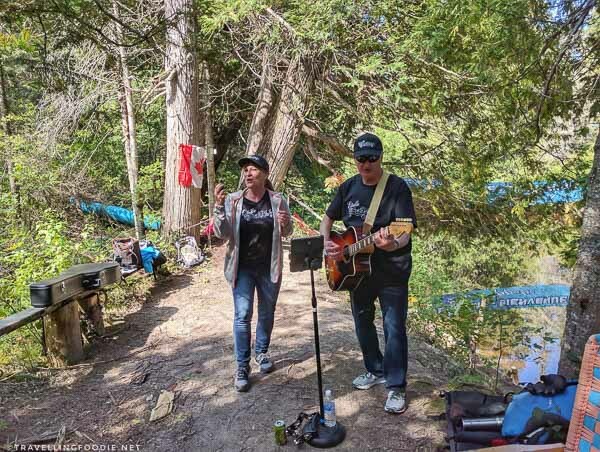 Live Music was available daily throughout the festival. 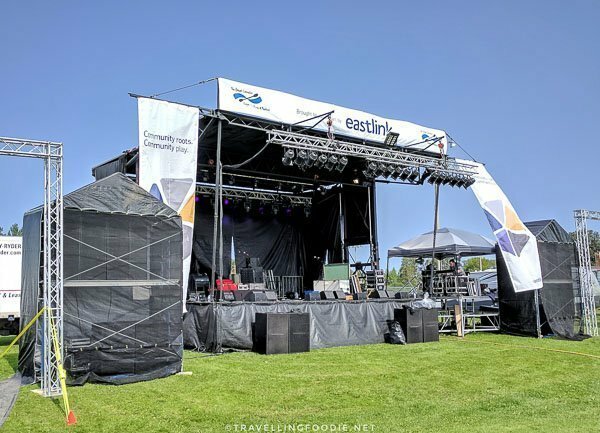 The ONtour Concert series, a live and free concert touring across Ontario to feature some of Ontario’s musical talents, held a concert at the ONTour Stage. 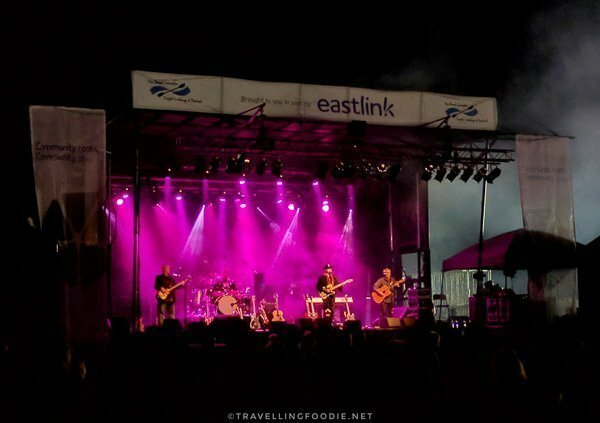 On the main Eastlink Stage is where the live concerts occurred with bands like Hotel California (The Original Tribute To The Eagles), The Mudmen, and Harlequin. 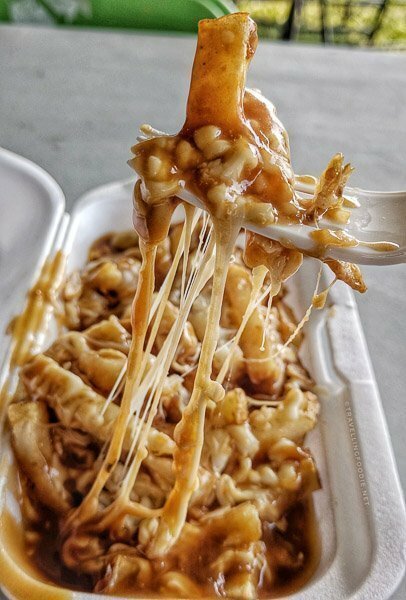 One thing I always look forward to in festivals is the food. It’s a great way to try a wide variety of food from different places at once. There were at least 10 food and drink vendors. There were even some big chains at the festival. Domino’s Pizza was selling $2 pizza slices. Tim Hortons was serving free coffee and Real Fruit Chill (mixed berry), which was highly refreshing in the hot sunny day. It was interesting to see that Thai Ice Cream Rolls has made its way to Timmins. Radical Gardens is the first to be offering it in the city. 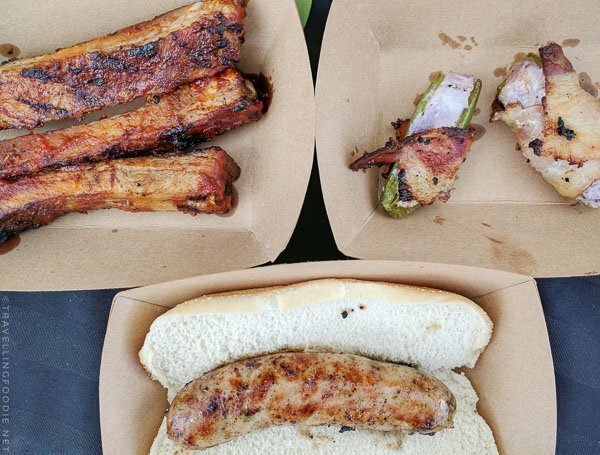 I really enjoyed the Local Radical Ribs from Radical Gardens. 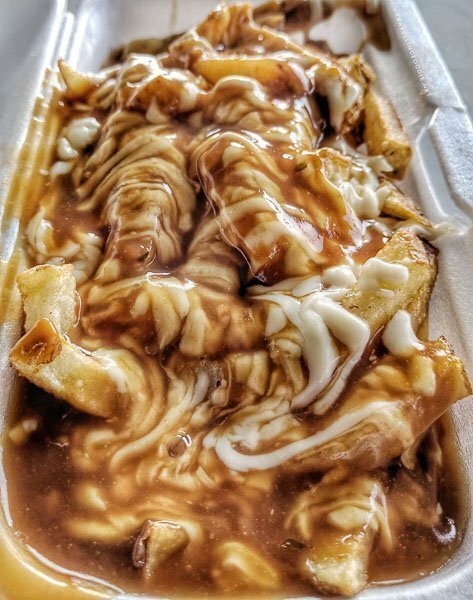 It was very tender with a good amount of fat, and the sauce was very flavourful with a good hint of spice. 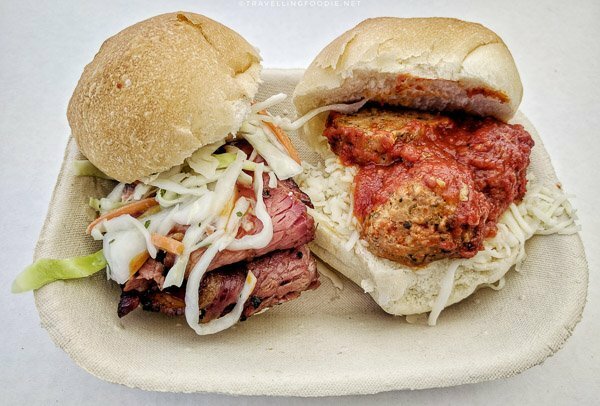 The Meatball Sliders from Toffanello’s Fresh Pasta was just delicious. 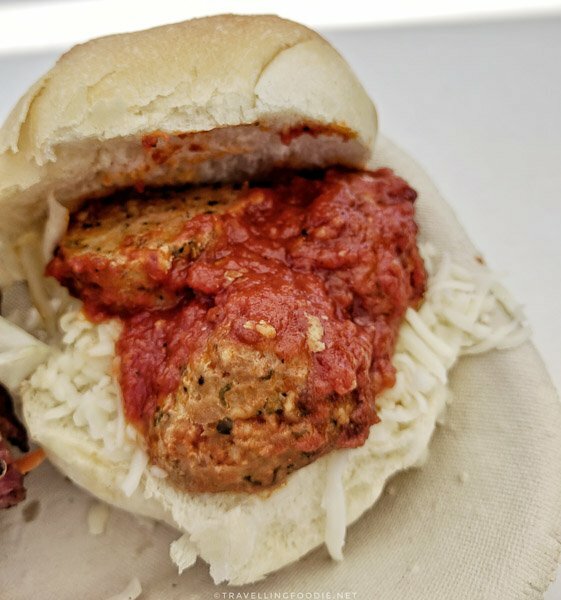 The meatballs were big and meaty with the right bite and texture. 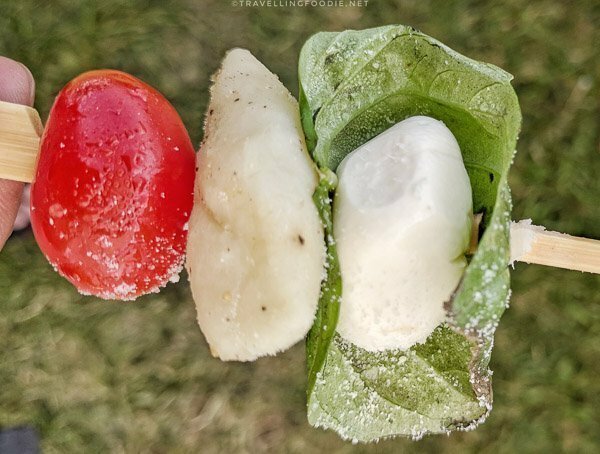 I drool just thinking about these on a meatball and spaghetti pasta. 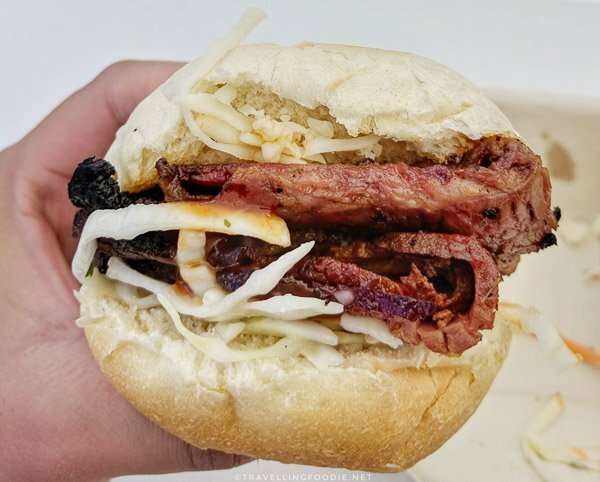 The Smoked Brisket Sliders from Dabrowski’s Smoked Meats Ltd were smokin’. I loved the smoke flavour on the brisket. 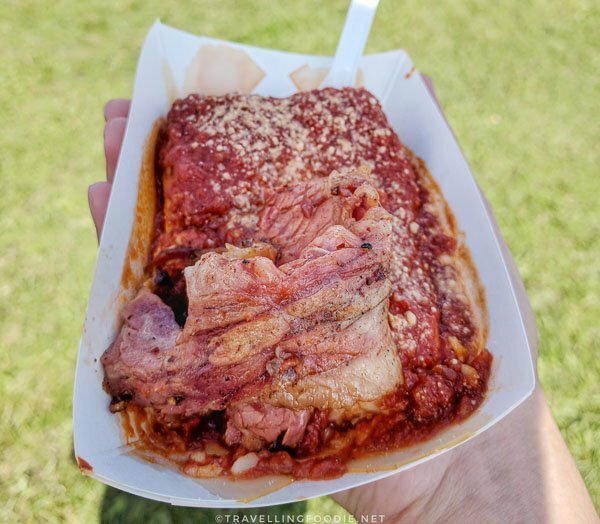 The moist (“fatty”) brisket was heaven – I highly recommend the moist part when it comes to brisket. 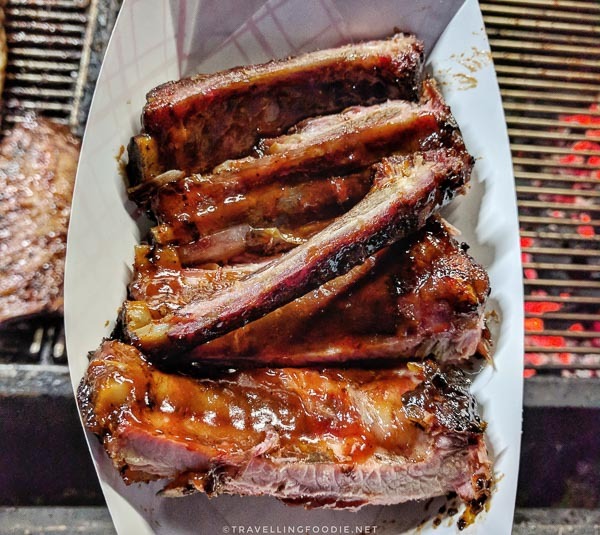 The Ribs from Railroad Ribs were fall off the bone. I liked that they didn’t put too much sauce so as to let the meat and grill flavour shine. 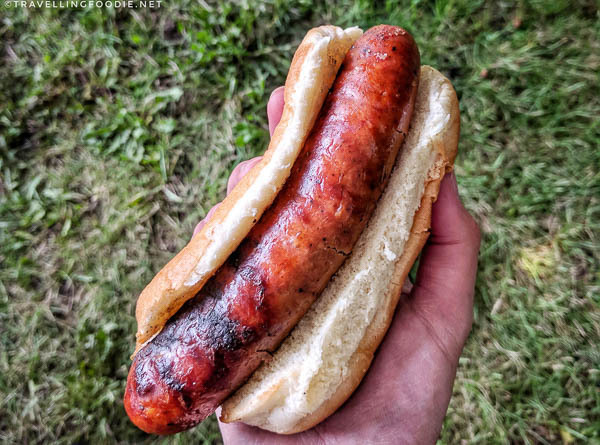 The Debreziner Sausage from McIntyre Catering was so juicy and meaty – no need for condiments on this one because the sausage itself was already spiced and seasoned! 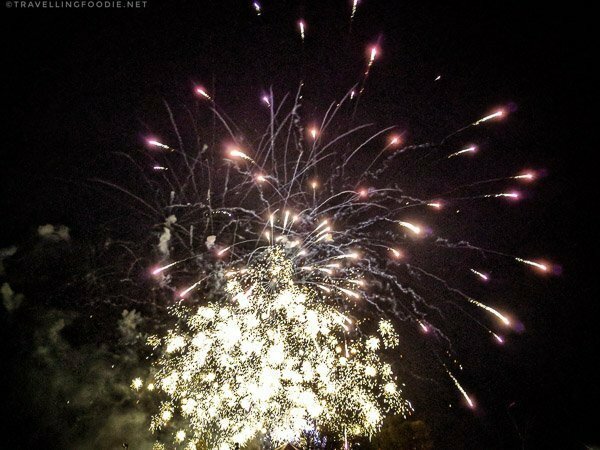 On Saturday night at 9:30PM, the Musical Fireworks Extravaganza took place. What made this unique is the fireworks display is matched to the music being played. The fireworks display was very grand and definitely a great way to have an explosive night at the festival! 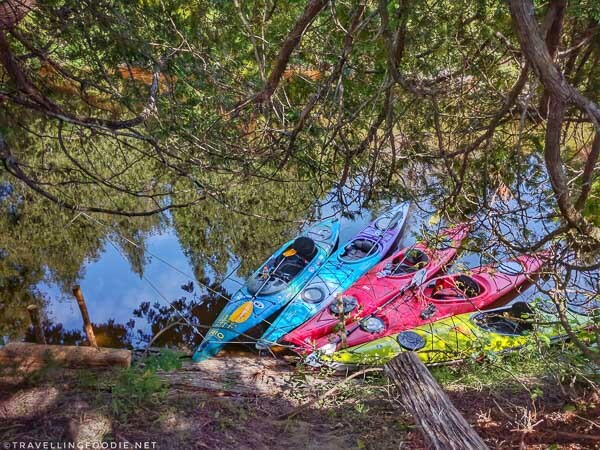 One of the main highlights of this festival was the 9th Annual Kayak Challenge. 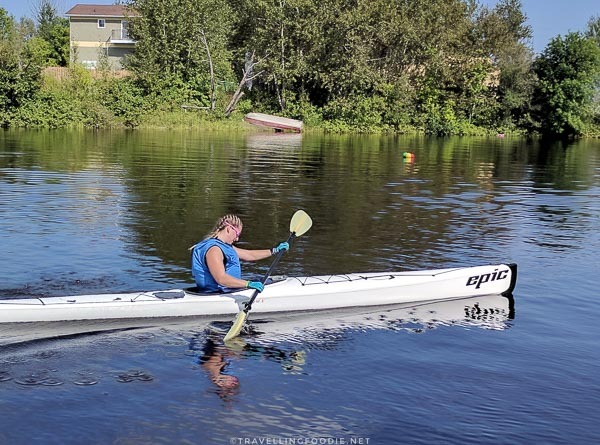 There were 10 Kayak Races of different levels ranging from 3-km to 32-km. 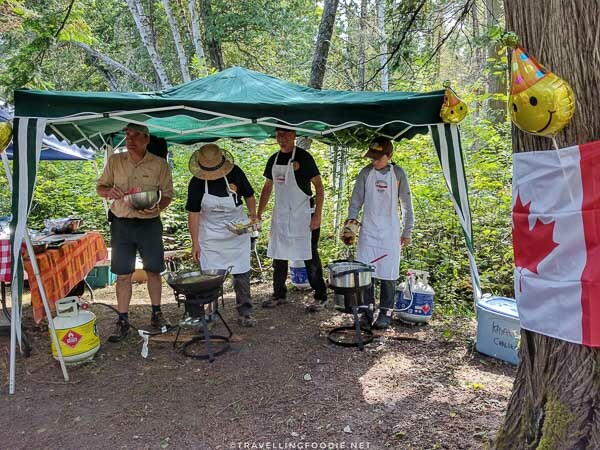 A total of 127 participants registered with people coming all the way from Southern Ontario, British Columbia and Quebec. I had the opportunity to join the 3-km Celebrity Challenge alongside the mayor and councillor of Timmins, and other members of media. Suffice to say, I’m an out of shape Travelling Foodie. I finished dead last at 32.57 minutes, which was ~10 minutes behind the first place and ~4 minutes behind the second to last. Nonetheless, I felt like a winner by completing the challenge, which was my main goal and a personal accomplishment for me. This was only my second time kayaking, and the first time was just leisurely paddling around by the Hudson River pier at NYC. Participating in this challenge made me realize how fun kayaking is. It is so much fun and relaxing being on the water and taking in all the nature around you. At the end of the challenge, participants got to choose between a t-shirt or a handcrafted pottery coffee mug from When Pigs Fly. 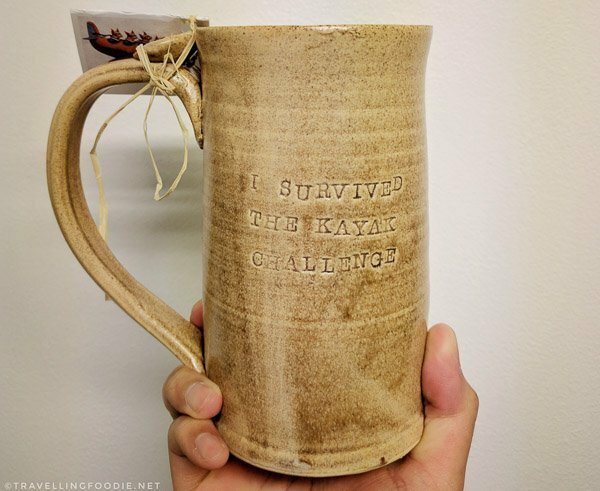 I opted for the handcrafted coffee mug because I felt it was much more unique, and the message at the back of the mug was very fitting of my experience, “I survived the Kayak Challenge”! WildExodus brought their popular pontoon boat cruise to the Great Canadian Kayak Challenge and Festival. 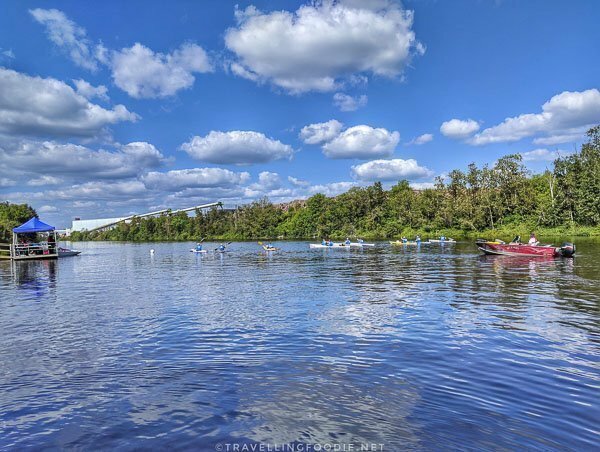 The Mattagami Cruise was a two hour guided pontoon boat cruise along the Mattagami River that offered sightseeing of scenic City vistas as well as the Millionaire Row, the millionaire homes of Bonaventure Drive. 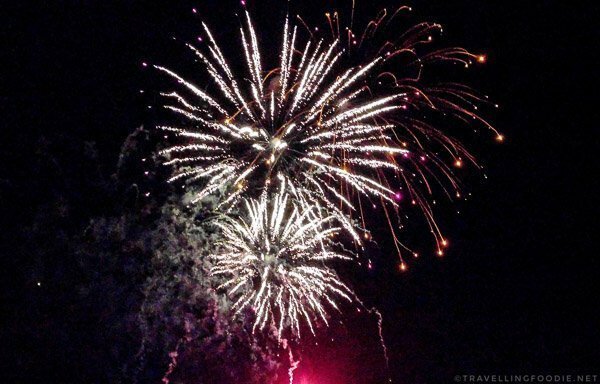 Travelling Foodie Tip: If you go on the last cruise on the night of the fireworks, you’ll get to watch the fireworks on the river. The cruise is one hour each way. Just a note of caution when bringing kids though, they might become restless at some point since the cruise goes in a slower pace. 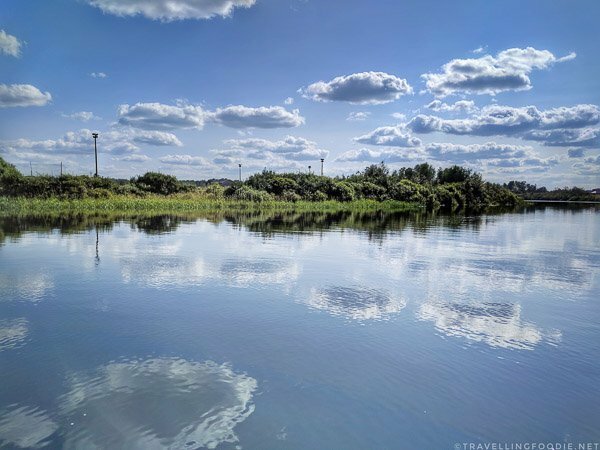 I took the cruise after doing the Kayak challenge and it was definitely a great way to relax and unwind while being surrounded by nature. The route is opposite the Kayak Race route as well. 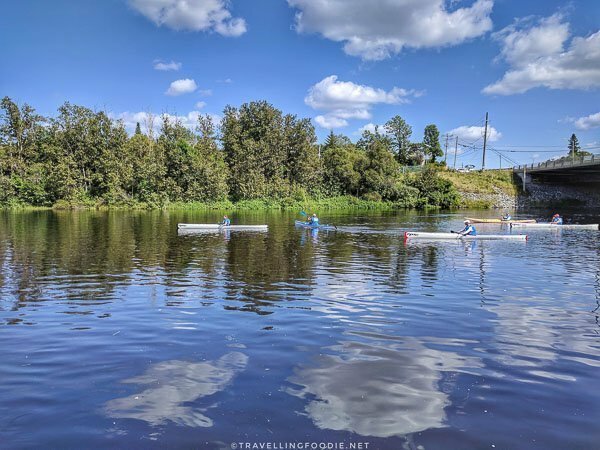 When I thought I can get a rest from kayaking after the Kayak Race, I found out I was paddling 5-km the next morning for the Family Leisure Paddle & Shore Lunch which started at 10AM. This was actually the main highlight for me during the festival because it is such a unique experience. 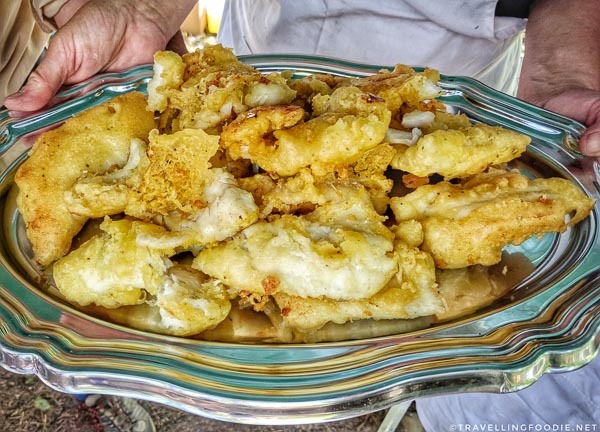 I highly recommend you to do this, especially if you haven’t really paddled before, as it is a great introduction to kayaking and lets you experience a traditional shore lunch. It’s also a great way to make some new friends. 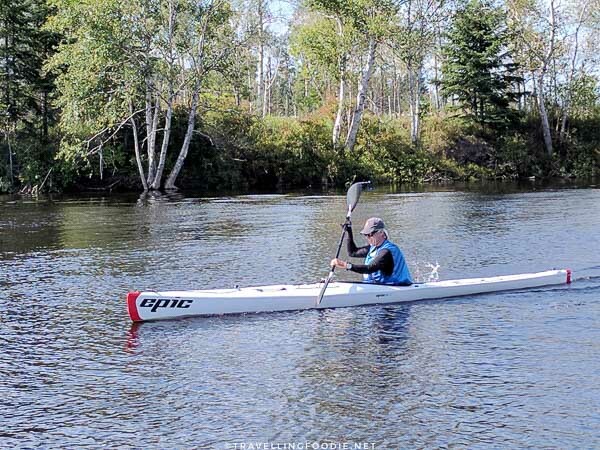 The route for the paddle and shore lunch was also different from the Kayak Race and Pontoon Boat Cruise. 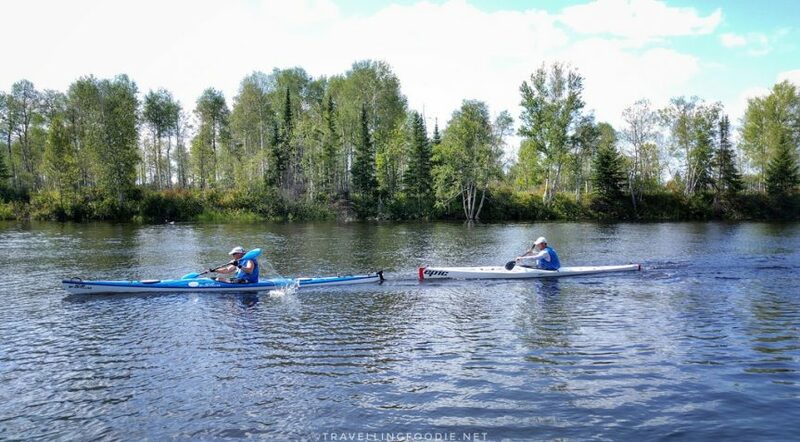 Our guides, Doug and Arv, patiently taught me the proper way to paddle, which I wish I knew during the Kayak Race. After kayaking for roughly ~5.1-km, we saw a Welcome banner on the river – we have arrived. We dock and get up the shore to find the Wilderness Cafe. 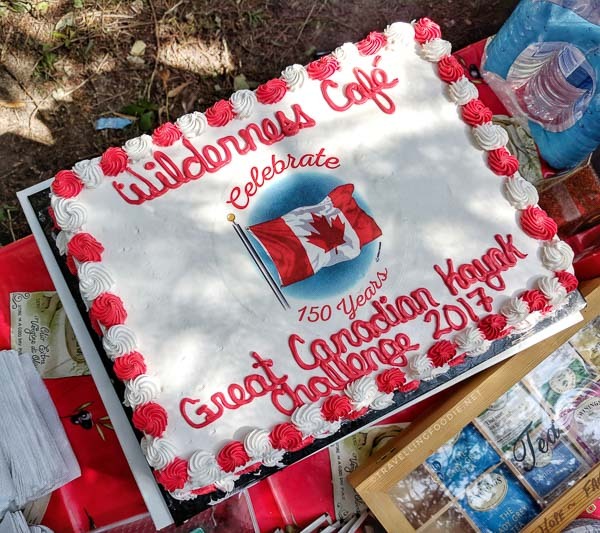 The Wilderness Cafe is this exclusive cafe that only happens once a year… during the Kayak Festival. It was setup by the wonderful team of John, Maria, Pete and Lincoln. In celebration of Canada’s 150th birthday, there was a special cake made. 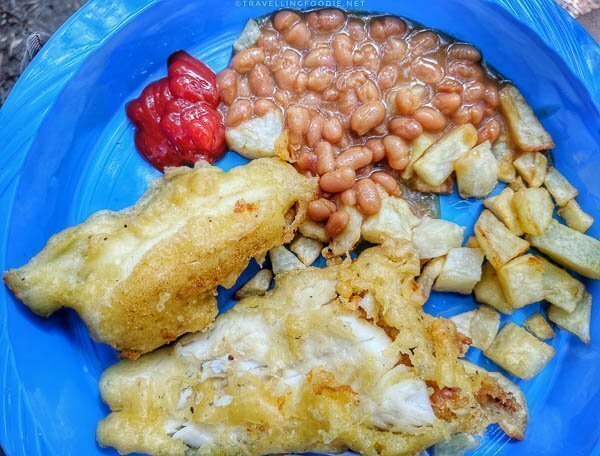 For the shore lunch, we had a fish fry with freshly caught pickerel by the Wilderness Cafe that day, as well as home fries and beans. 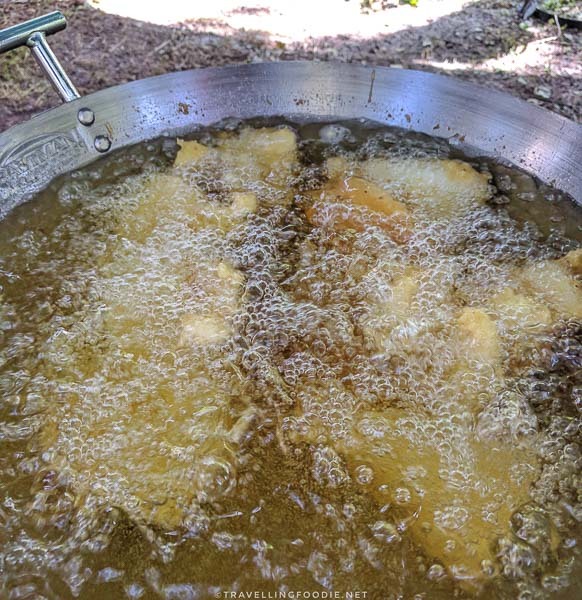 Excited for some fish fry! We also had live music from duo Estelle and John who kept us entertained with popular songs, both new and old, as well as Estelle’s original song Nous Les Filles. 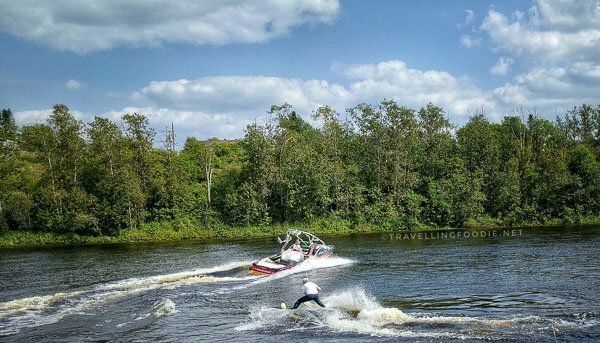 Aside from all the kayaking, festival goers got to witness some daring water stunts from Summer Water Sports and Muskoka Flyboard. 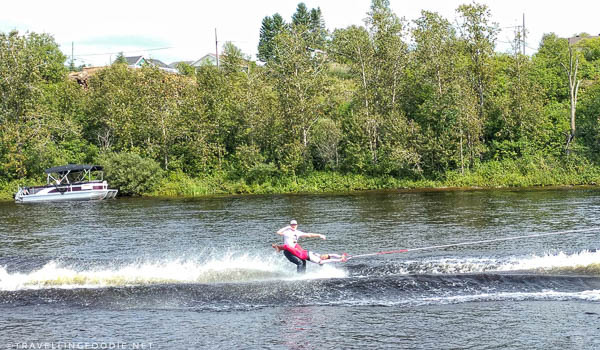 American, Australian and Canadian water skiers showcased their skills in free style water ski jumping, water ballet and other aquatic acrobatics, including flyboarding stunts from international water skier Sam Cowley. 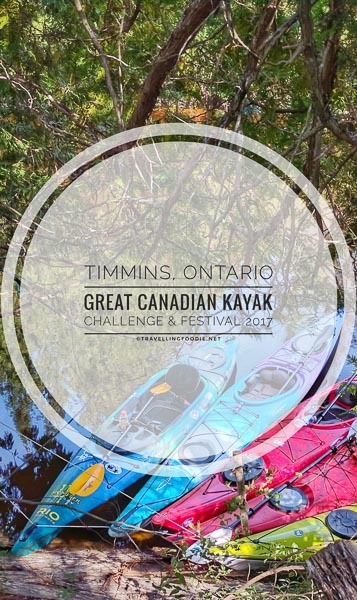 Did you attend the Great Canadian Kayak Challenge & Festival 2017? 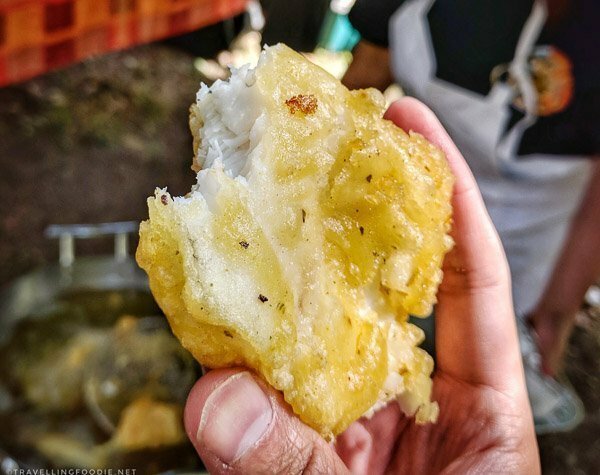 What were your favourite things to do and eat during the festival? DISCLAIMER: Though this was an all-expense paid press trip with Tourism Timmins, all opinions are my own. 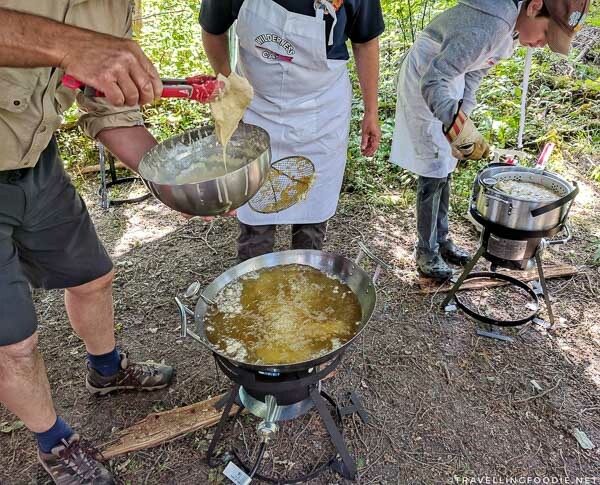 Posted on September 1, 2017 December 31, 2018 by Travelling FoodiePosted in Canada, Food, Ontario, Timmins, TravelTagged activities, entertainment, events, nature, sights and landmarks.